Tooth decay is an irreversible infection- usually bacterial in origin- that causes demineralization of the hard tissues and destruction of the organic matter of the tooth. If demineralization exceeds saliva and other remineralization factors like calcium and fluoride, these tissues progressively break down, producing dental caries (cavities, holes in the teeth). If left untreated, the disease can lead to pain, tooth loss and infection. Today, tooth decay remains one of the most common diseases throughout the world. It occurs when your teeth are frequently exposed to foods containing starches and sugars like soda pop, candy, chocolate, bread, cake and even sticky fruits. Natural bacteria live in your mouth and form plaque. Plaque interacts with food deposits on your teeth to produce acid that will slowly dissolve the calcium in your teeth. An area of decay may take as long as 6-8 years or as short as 6 months to dissolve the outer layer (enamel) of the tooth. If you have a cavity, this outer layer has collapsed producing a hole that cannot repair itself. • In root cavities: As you age, your gums can recede, leaving parts of your tooth root exposed. Since there is no enamel covering your tooth roots, these exposed areas easily decay. Most people over 60 have root cavities as a result of gum disease. 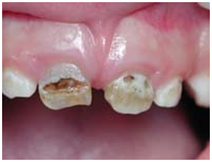 • Around existing fillings: Decay can form around existing fillings and crowns. This is because these areas are not as smooth as a natural tooth surface and can decay easier. What areas are likely to decay? The longer you wait to have a tooth treated, the more intensive, lengthy and costly the treatment will be.